With 15 years of experience under his belt, the culinary journey of Syrian-born Chef Khder Mohsen Al-Issa began with his restauranteur father. According to Chef Khder Mohsen Al-Issa, lamb dishes are central in Middle Eastern cuisine and lamb meat produced in Syria is known for lacking its distinct odour. 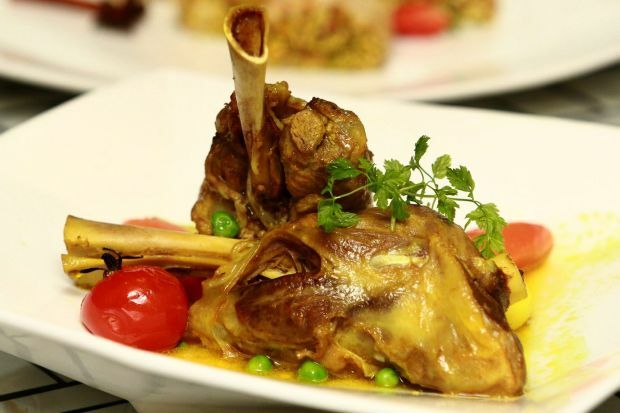 “This Syrian lamb shank recipe is fairly simple as the lamb shank is cooked mainly in olive oil while the sauce is only added after cooking,” said Khder. He also commented that due to the fact that the shank consists of sheer muscle, it is one of the tougher lamb cuts and hence takes much longer to cook. Cooking the lamb shank: Coat the lamb shank in flour and fry it in olive oil. Turn it occasionally until it is golden-brown on all sides. Add water, saffron and bay leaves, and cover it with the lid. Bring the fire to medium heat and let it boil for 1.5 hours or until the lamb is cooked and tender. Preparing the sauce: Heat up a non-stick pan and add in shallot, carrot, potato and some of the gravy produced from the boiled lamb shank. Braise for 12 minutes. Add lemon juice and garlic. To serve: Spoon the braised vegetables onto a warm plate and place the lamb shank on top. Garnish with the herbs and roasted nuts.